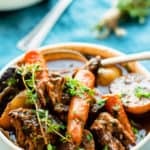 This slow cooker gluten-free beef bourguignon (or Beef Burgundy) recipe is the best I have ever tried. 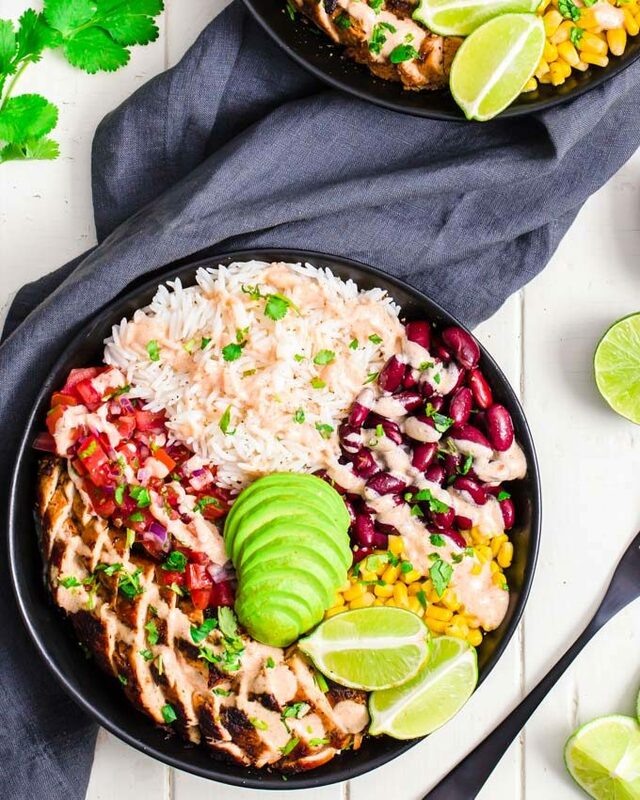 Cooking it in a slow cooker makes it super easy to prepare and extra tasty! 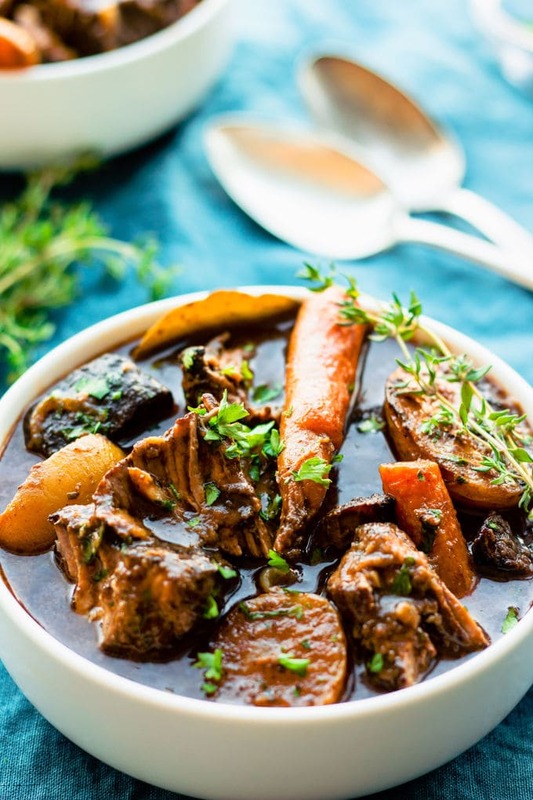 My very simple version of this classic French stew is entirely gluten-free and can be made paleo by picking the right red wine for this particular diet. 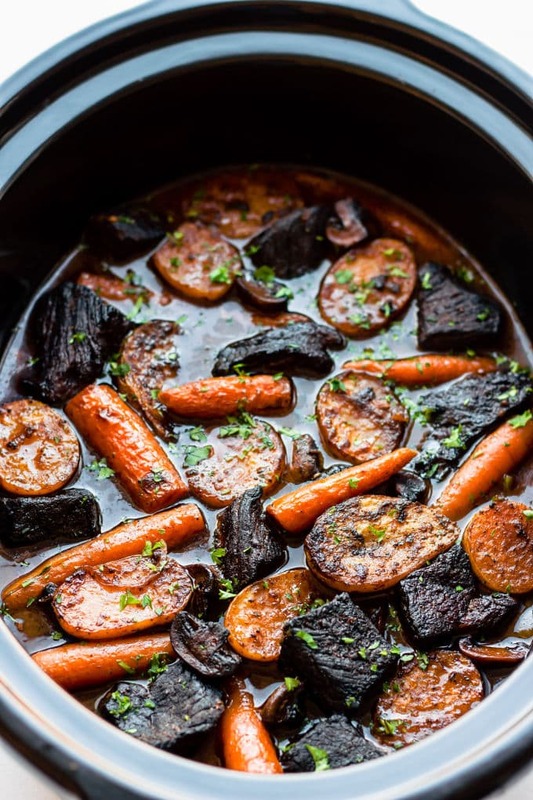 If you were wondering what exactly is beef bourguignon (or beef burgundy, they are the same thing), well it is essentially beef, carrot, mushroom, and potatoes slowly stewed in a red wine sauce. It is absolutely delish. Some recipes don’t include potatoes. For this particular recipe, I used cornstarch instead of all-purpose flour to coat the beef cubes before roasting them, to make it gluten-free. 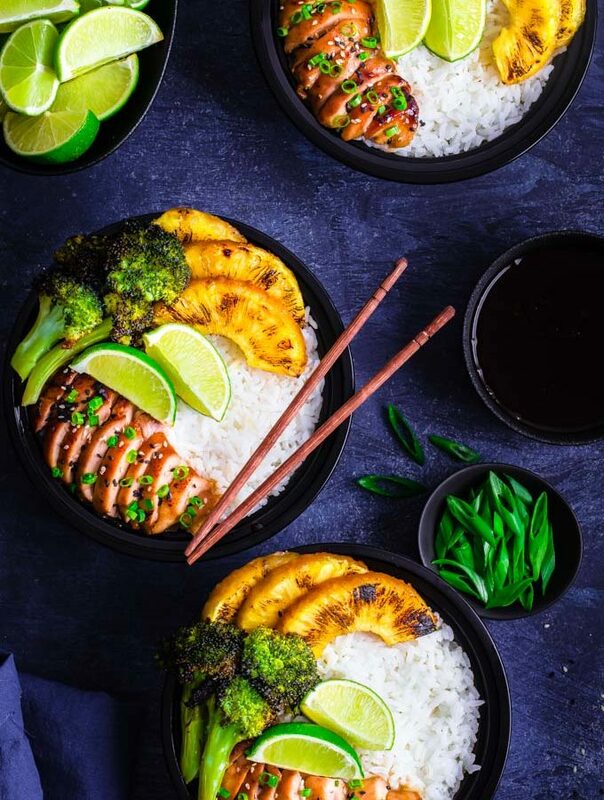 For the paleo version, simply swap cornstarch for arrowroot and pick a good quality organic red wine which will be more paleo friendly. If you prefer leaving potatoes out of your paleo diet, replace them with either cauliflower florets, parsnip or simply by adding more carrots. You could also skip potatoes altogether, but you would have to cut the amount of broth by about a third, or you will end up with a soup! 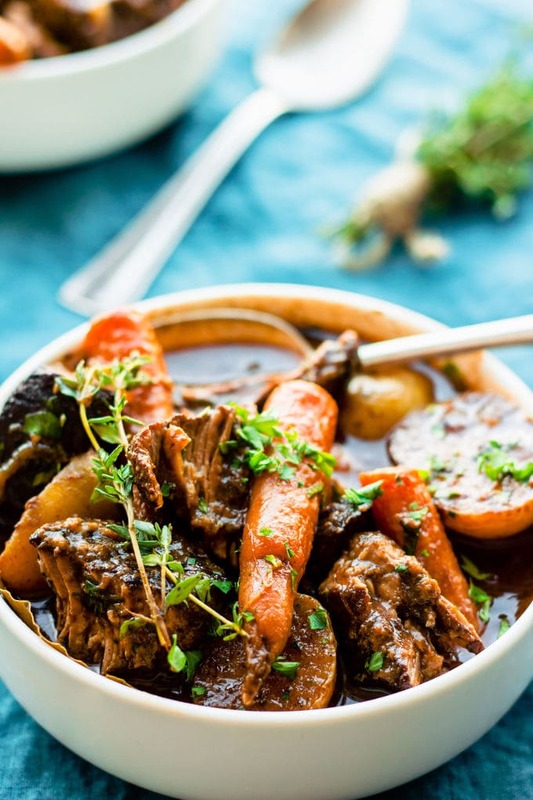 How to cook beef bourguignon in a slow cooker? For maximum flavor, coat beef cubes in cornstarch then roast them in olive oil, deglaze the pan with red wine, set aside, and then repeat this process with mushrooms. Make sure you scrape the pan every time you deglaze to capture all the flavor! Again, both of those steps are optional: if you’re in a rush you can totally skip them. But if you have time, I strongly suggest you do them. 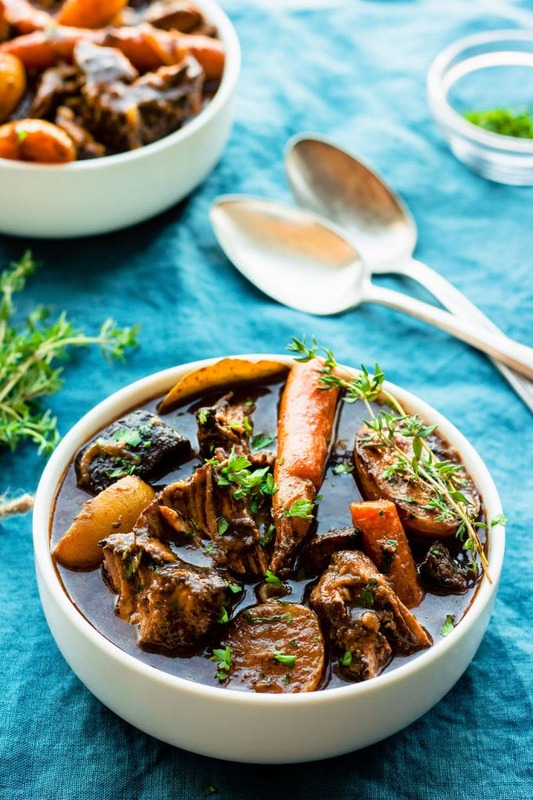 This gluten-free beef bourguignon is literally to die for, mostly because of those 2 simple steps! Use the freshest ingredients. That includes fresh herbs. You could always use dried, but fresh thyme does make a difference. Finally, add the rest of the ingredients to your slow cooker and cook on low setting for 8 to 10 hours. Cooking time may vary. If the meat is stiff after 8 hours of cooking, continue cooking until you can easily separate the beef cubes using only a fork. (You can use the “high” setting on your unit at this point to speed up the process). Nobody likes stiff beef bourguignon: if it isn’t tender, that means it’s not finished cooking. It has nothing to do with the quality of your meat. Cook it some more! The variety of carrots I used for this recipe were Nantes carrots. I washed them and left the skin on. Again, this is optional, but this variety is sweeter and tastier, plus leaving the skin on adds more texture, taste and is also healthier! 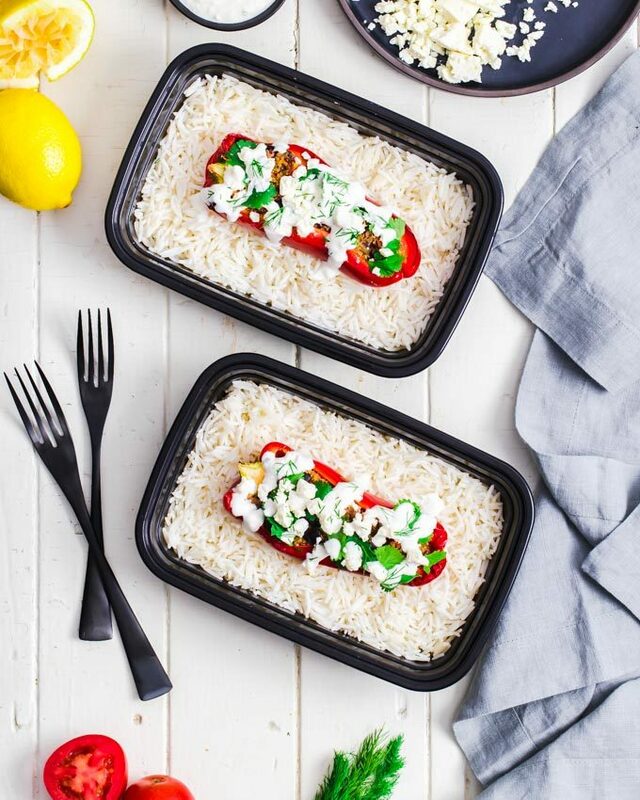 You could also use fresh carrots from a farmer’s market. But hey, no stress: use what you have on hand, in the end, it won’t matter that much! How to plate beef bourguignon? Serve it either on mashed potatoes, large egg-noodles, farfalle noodles, rice or plain with a side of green salad (or not!). Pat the beef cubes dry using clean paper towels. Coat them with cornstarch/arrowroot and discard excess starch. In a large skillet, heat 2 tbsp olive oil over medium heat. Brown the beef cubes on each side. About 8-10 minutes. Transfer the meat to the crockpot. Deglaze skillet with 1 cup red wine and scrape to capture all the flavor. About 30 seconds. Transfer red wine to the crockpot. In the same skillet, heat 2 tbsp olive oil over medium heat and roast the mushrooms on each side for 5-6 minutes or until golden brown. Add crushed garlic at the end and allow it to sweat for 30 seconds. Transfer the mushrooms and garlic to the crockpot. Deglaze skillet using 1 cup red wine and scrape for about 30 seconds. Transfer red wine to the crockpot. 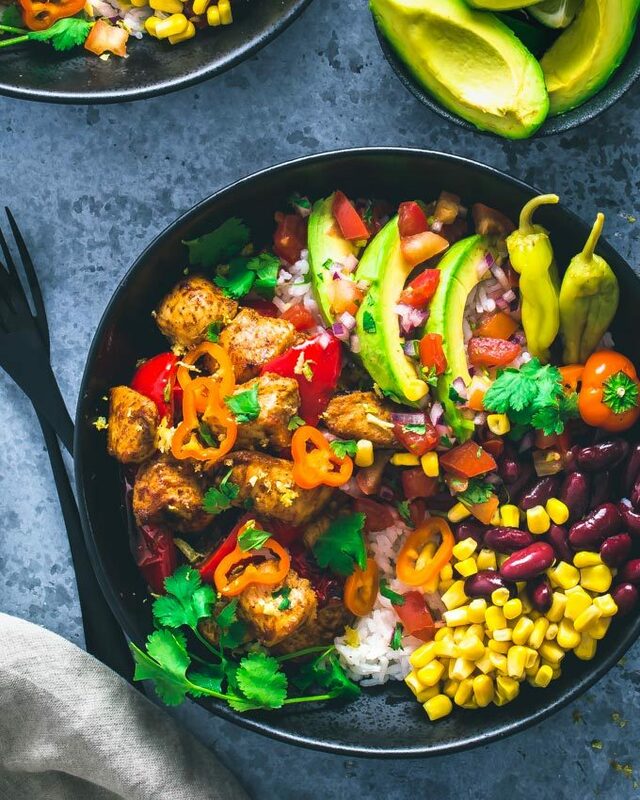 Place the rest of the ingredients in the crockpot and mix them gently. Place the lid and turn on your crockpot on the desired setting. I personally cooked it on low for 10 hours. Cooking time may vary depending on your machine. Allow 6 to 8 hours of cooking on High setting.